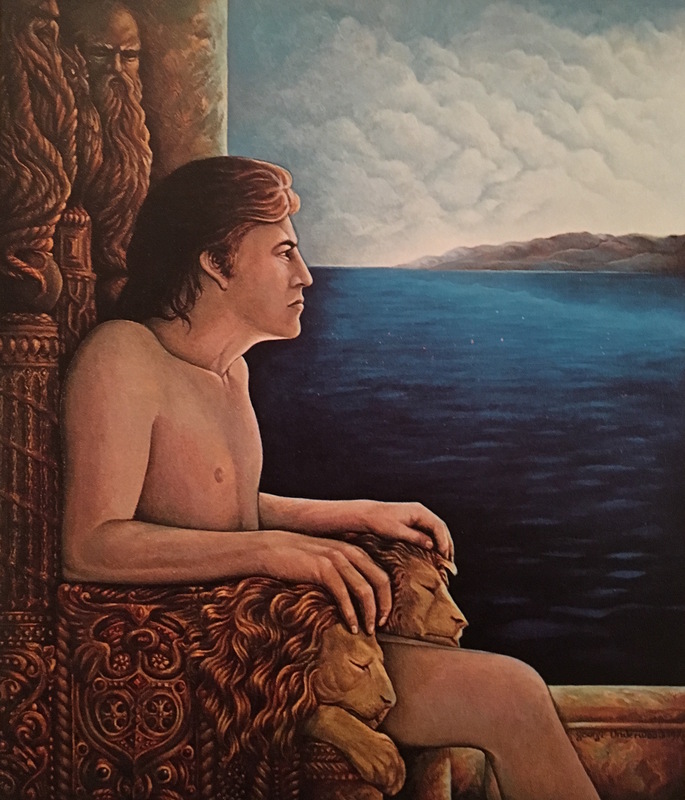 THERE IS A TALE of a shipwrecked man who washed ashore on an island naked and bereft, whom the islanders discovered, and proclaimed king. At first taken aback by his fortune, he soon accepted his new life as usual, and enjoyed his privileges. At the end of a year, however, it was the custom of the island to strip the king of his power. This they did every year, only to crown another castaway upon their shore. Illustration by George Underwood in World Tales, 1979. If an unremarkable clerk went to bed thinking himself unimportant, and woke up a king, or president, the same man might think very highly of himself by lunchtime. Not long after, he would think of capitalizing on his days in office, or on the throne. He would approve of the accretion of his own power, seek the adoration of “the people” or “his people,” and fear any hint of falling from grace. He would speak of “the nation” as casually as he once filled in forms, convinced that no one else could shepherd it so well. Take away his titles, and it might be possible to restore the man to sanity regarding his own powers. It might become clear to him that fate had treated him capriciously not because he deserved it, but on the say-so of thousands of others convinced that he represented something beyond himself. A grand illusion had taken him up, and let him go—the same illusion persisting still, without him. Thus he had been plagued by an illusion of grandiosity. This is far easier to make clear than the corresponding possession of the commoner by myths and words and feelings. His lifelong following-along, his faith in the importance of imagined things, his schooling in belonging and obedience, remain invisible to him. In another land and time, the following-along takes a different course, with different names and pretenses. That kind too seems entirely natural to those caught in the grip of madness, as an observer might say. It is equally clear to the Aztec attending a festive sacrifice to Huitzilopochtli, and the tsarist cheering the monarchs of Imperial Russia, and the American democrat on voting day, that one can do nothing else, and nothing better. 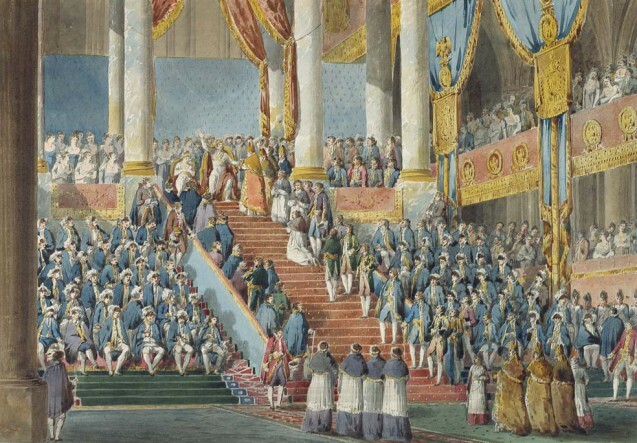 Emperors, tsars, politicians, voters, and victims each believe in their role’s essential importance to the structure of the world. In every place and time, each role-player following along in their grand illusion harbors the feeling that they live in the exceptional place in all the world. They live in the exceptional society, special among all other peoples, and enjoy god-given favor or natural advantages. History tells how many have believed in incomparable rectitude, in inborn virtues, or inherent superiority. History tells how many come to believe in a great mission. They cannot fail as others failed. They cannot suffer what others have suffered. They tell tales of the greatness that will not end, and each has a part in it. Theirs is some manifest destiny to lead, rule, conquer, civilize, liberate. Thus the chosen people always deserved special permissions to act, or to be entrusted with things others would only abuse. History tells of the infamy of exceptions. So many nominate themselves the people of a great name, rise to fame, and as empires, bring the world they know to ruin. 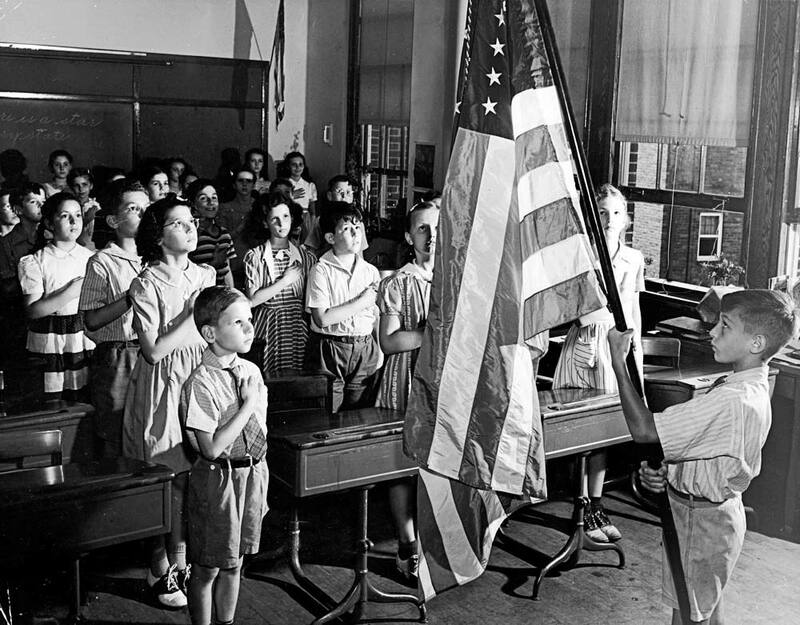 The Pledge of Allegiance to the Flag, loyalty oath to the United States of America taken by children. Photo circa 1950s. A VISITOR TO A LAND, like Astolphe de Custine in Russia, or Alexis de Tocqueville in America, can observe with unfamiliarity and perhaps clearer eyes than the inhabitant who calls himself a citizen or a subject, who has never once since juvenile inculcation regarded its native customs and political system as foreign to himself. In turn, whoever leaves the exceptional place, the world traveler, the expatriate, or the exile, has a chance to regain realism about their place of origin by gaining distance and perspective, and the foreignness able to make familiar things strange again. As does the outsider to habits of mind, though he takes himself nowhere, and possibly changes little around him. For in the exercise of making himself an exception to the ways others live, he also begins to make a thinker. An insider to a culture of public mythology, such as politics or religion, has been conditioned to respond to slight alterations (in absolute terms) as though they mark the extremities of two poles. He fears reversals of fortune from rearrangements of the pieces in a great game. The game draws him in to play as though everything depends on white or black winning or losing. It does not occur to him that many options would open up from refusing to play the same game by following the same rules. The native or acculturated believer in a political system places hopes in a different king, a certain president, a legal or policy change, a new party in the voting, a selection of judges, a new mayor, a bold proclamation or a new program, and this is the scope of his imagination. Of course a modest adjustment to institution of a system could transform prospects for personal advantage, albeit probably for far fewer than believe it will. Yet only the outsider can see that the scaffold does not change because anyone clinging to it is allowed to climb to a higher rung on a ladder. If the insider has dreams and ambitions, they narrow to fit the framework. Only the outsider to this mentality, an outsider in mind if not in place of origin, can conceive of any genuine transformation or revolution. The insider’s idea of innovations and reforms upon which he rests his hopes, upon which his world appears to turn, turn out to be subtleties, technicalities, or rhetorical changes. Someone less invested or accustomed perceives variations on a theme. Underlying presumptions go on, unperturbed, and have consequences. The outsider finds it eerie and disappointing to observe the care and concern given to contentious trivialities, and to rituals. Insiders hang on arcane signs, lend significance to details and meaning to public performances, without an inkling these could be of no intrinsic interest, and have no definite effect. As a result the outsider has surreal moments, as though surrounded by tribesmen who inexplicably have practical expectations from adding a different feather on the headdress of the chief. It is obvious that no sensible objection he makes to them could change their mind; that would mean dismissing what they consider serious matters. And if they had been attuned to putting their fixations in perspective in the first place, they would have given him no cause to speak. Should he try, insiders would make it clear they like to hear nothing against their custom. 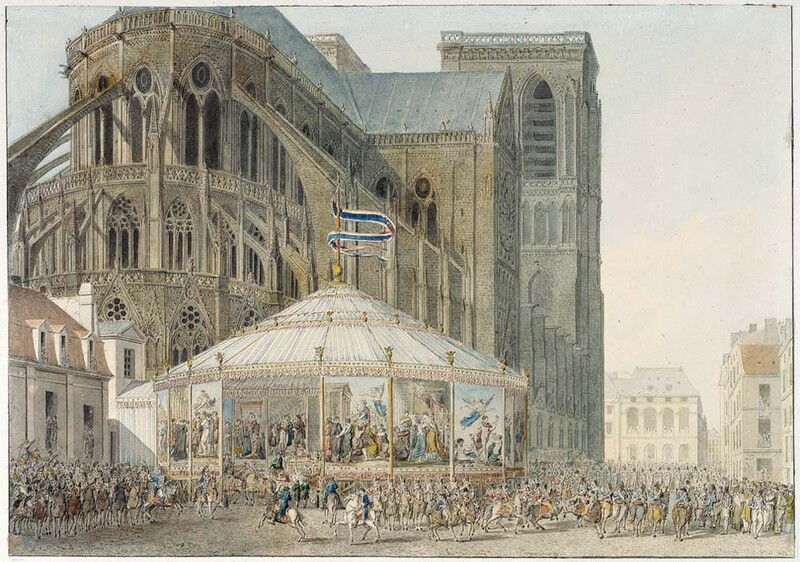 The Rotunda, Decorated with Tapestries, which Greeted Guests on their Arrival at Notre-Dame for the Coronation of Napoleon as Emperor by Pierre-François-Léonard Fontaine, 1804. THE PUBLIC AND OFFICIAL MYSTERY clouds thinking about people, material, and relationships which would otherwise not be deceived. A sort of alchemy transmutes the sense of things completely. A monumental weight lends gravity to implausible notions, as though an edifice looms over everyone who looks up, and its architecture supports overwrought ornaments and festoons, all in seriousness. A religious air pervades also, and suffices to endorse absurdity. It almost requires affected trappings, like peculiar costumes and stilted language, to signify that a state of majesty obtains, which lies beyond the mundane, and is not subject to common sense. Jargon, like that of theologians or legal experts, indicates separate subjects which cannot be understood by normal means, or unschooled people. Official terms with special meanings are not meant to suggest that their real-life substance bears careful thought, but rather to invite no consideration by ordinary people. When rulers of a powerful modern-era state order and implement an embargo of trade and travel that causes hardship, if not starvation, an outbreak of disease, and infant mortality, they call it sanctions. Just this particle of jargon makes a special category for punishing a wayward “regime” that exculpates other rulers who impose a blockade of goods, and implies no cruelty to poor and powerless people unable to escape and desperate to survive. Formality, euphemism, and propriety hide the substance of things. Offices, rituals, and positions sanctify acts normally understood quite differently. Different names and words deceive. Emotions deceive, charged by longstanding bonds to grand illusions. Culture normalizes. Hardly a man really believes himself guilty of great crimes when he assumes a grand role and takes part in great acts, under the public absolution of sin, and indulgence granted for great works. The Oath by Pierre-François-Léonard Fontaine, 1804. The main remedy is to endeavor to view a phenomenon, a happening of politics or society, as though it were not public, official, or large in scale. This effectively dissipates the illusion. By taking the humble prospect of “great men” and appointed officers, and by down-to-earth judgment of individuals’ actions and material effects, one recognizes people effecting their own benefit, or behaving with themselves in mind. Over time, one sees they lack foresight also, when their gain or preoccupation in the shorter term costs themselves along with others in the future—although many do not pay personally for rapacity, and despite incompetence, many fail their way upwards. One watches them causing problems or crises, only to demand trust, obedience, and resources to solve them by forced measures, which cause further problems and crises. One is no longer blind to their starting trouble by turning people against each other, yelling across both subtle distinctions of identity and arbitrary lines of division. One sees through the brittle posturing of bellicose rhetoric. One learns that literal wars on enemy governments or insurgents, and figurative wars—on intoxicants, on poverty, on crime, on immigrants—will all assault people, destroy property, induce needless suffering, instill violent and desperate mentalities, ruin lives, and disrupt peaceful association for fellowship and commerce, which has no need of such “protection,” despite strident warnings and fearmongering. One witnesses the epitome of hysteria, fomented by the alchemy of words, over each “invasion” of job-seeking migrants, or refugees. These are nothing other than the journeys made by unemployed people to reach available opportunities, or unsafe people to reach safety and reestablish constructive lives, who are not transformed into threats by crossing the line on a map or violating a statute. And only a bigoted calculus would ascribe to refugees the kind of militancy that drove them out. Immigration makes a preposterous target for attack—therefore most instructive to our suspicions. For it entails not even the harm of injudicious but consensual drug use (albeit far less harmful than a “war on drugs”), but instead a wholly preferable condition; more productive than vacant jobs or a shortage of talent, and much more salutary for refugees than remaining in danger or squalid camps. Immigration presents a solution to economic problems and a resolution to crises caused by wars, not a problem or crisis in itself. Blocking movement by force, unprovoked arrests, laws barring employment without permission, and policies withholding it, not only obstruct amelioration, but further diminish freedom. Lend no special category and no special credence to the public and official “campaigns,” and it becomes possible to deconstruct what is happening, beyond leveling accusations of scapegoating, bigotry, or misbegotten execution. If one imagines that the world’s largest syndicates of protection racketeers were long legitimized by custom, eminence, and well-meaning attempts to humanize a parasitical institution, their ostensible rationales are no longer mystified (and competence or incompetence must be gauged quite differently, by them). It would make sense for the grand racketeers to want to hobble competition from other syndicates, which erupts in wars over turf. But to fabricate legitimacy, they would also require the regular drum-beat appearance of bravely confronting one dire threat after another, over and over again, and patter on about it to anyone who will listen. The insider media furnish sympathetic interviewers paid to listen solemnly and seriously, and ask hard questions only about doing more. A military policy judged solely by evidence—living people hurt, killed, chased away, taken as captives, homes destroyed—loses its pretend dignity. One can see the provocation and aggression in acts of defense and national security, no longer blind to occupation, seizures, physical brutality, and the vilest permissions of state and uniform. The undertaking that employs soldiers and enriches arms merchants loses ill-gotten pride, and it can no longer even seem regrettable but necessary. The permissive credence given to armed policing is likewise clouded by impersonal illusions, like “justice,” and special license for official acts. Police assault, kidnapping, theft, and murder simply acquire different names, and as a rule, evade prosecution, while lesser offenses against police attract the severest treatment. Such is the local cloud of authority obfuscating phenomena, not unlike the clouded deeds called military, which happen also under the fog of scale, and in the haze of faraway places. 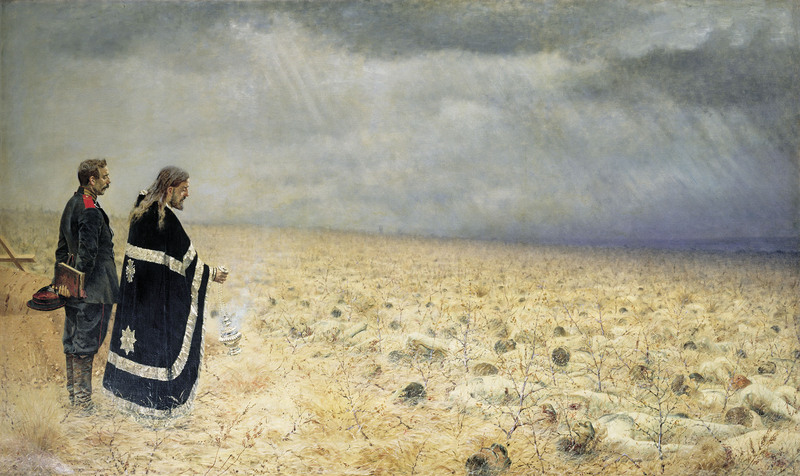 The Defeated, Requiem by Vasily Vereshchagin, 1879. By taking the humbling and down-to-earth view, one sees that violations of typical mores are allowed and not called crimes, at the scale of the state. For those proclaimed “leaders,” statistical murders or vast seizures of wealth are rather marks of greatness and bold intention. Robbed of public and official airs, the gross expenses and excesses of government or Church seem wasteful and vain as any conspicuous consumption or tasteless opulence. As they welcome the applause of those paying attention to grand illusions instead, those holding profitable positions in the respectable monopolies—on making law, and enforcing it—collude to cartelize other business by a thousand methods, on slim pretexts of doing good for “the economy” or “the country.” In exchange, they receive bribes before, and rewards afterward. They legitimize venality by the alchemy of entirely different words, and the custom of the practice. The whole grand kleptocracy of the modern-era state seems a triumph of ambitious maneuvers congratulated as public service, and of conniving personal greed, lauded for altruism in doling out funds to encourage support, after rulers, allies, associates, administrators, enforcers, publicists and sycophants have gotten a cut. In short, by endeavoring to view each happening of politics or society as though it were not public, official, or large in scale, one can see through the conventional and normal to the egregious, were it seen small, and see smallness in those who wish to appear extraordinary. 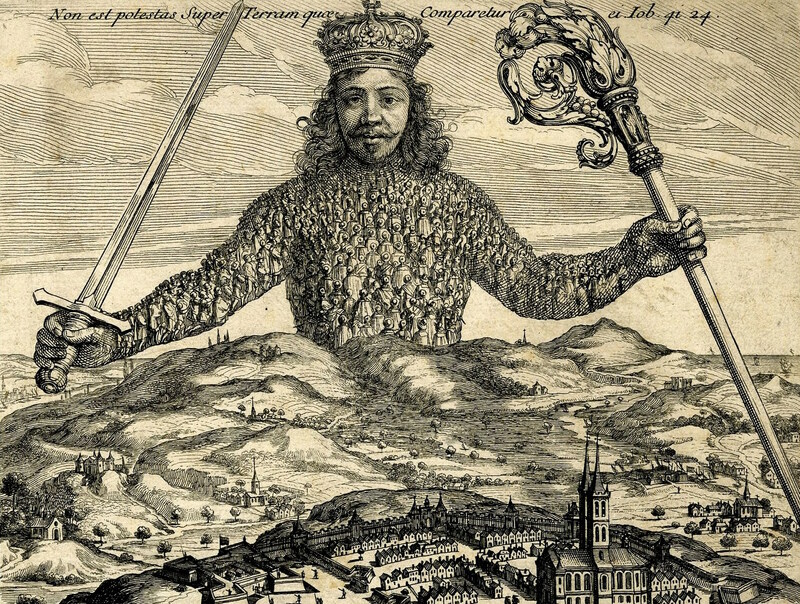 An allegory of the state, presented as an effigy of the body politic composed of citizens under sovereign power, from the frontispiece by Abraham Bosse in Thomas Hobbes’ Leviathan, or The Matter, Forme and Power of a Common Wealth Ecclesiasticall and Civil, 1651. THE POLITICALLY-ACTIVE CITIZEN for his or her small part believes in a right to impact other people through “democratically” sharing the power of government, and most have faith in a net advantage to be gained through wielding it. No matter his modern-era belief in majority rule, each citizen has been granted self-rule, self-government, or autonomy solely in metaphorical terms, which incorporate a collective self out of thousands or millions of people. Contemporary elections may certify select political leaders, among many more unelected leaders, but this practice does not invert the inflexible direction given by hierarchy. That legacy social principle inherited from military aristocracy and theocracy remains the default of government. Once a leader has acquired status, no matter how, now the leader makes decisions and gives orders. No subject of rule may dictate to leaders as the leaders dictate, which of course defines them as the rulers and not the ruled. “Rule by the people” presupposes the opposite of its implication that people will make their own decisions. Any subject is instead supposed to accept restriction of some decision-making, as in all rule. Under the power of the state, he is obliged to yield to superiors, to be governed by others’ decisions, and accede to official demands. The so-called “consent of the governed,” and many other terms, euphemize the age-old supersession of self-direction as it would emerge from personal desires and needs. More liberal governments attenuate obedience. All expect it. Remember that ruling is not only a metaphor, and it does not happen in the abstract—but to a person. What does this power of the state entail? Since it is meaningless if anyone may disobey the hierarchy of people giving orders downward, their ruling other people actually entails armed employees, arrests, legal charges, courts, fines, prison cells, or worse punishments for those who disobey. These are only formal ordeals, while harassment, smears, blackmail, threats, extortion, bullying, beatings, torture, and execution occur unofficially, as well as through formal process and institutional decree. Modern-era democratic states are not exceptions. Policy initiatives meant to sound positive and generous are no less compulsory. The appointed do force the unwilling to contribute and collaborate with government organizations and programs, ultimately by punitive methods. It is simply that the modern art of ruling respectably, relying less on instilling fear and advertising decisive brutality than former empires and lords, has become more concerned to camouflage the rough points of contact with the ruled, or excuse them. They have not become aberrational means, in the way that anyone might fall back on using force for personal self-defense. People called governments force other people to do things, not as a rare exception, but as a routine. If enforcers do not routinely repress demonstrators in the streets, or put down rebellions, they act against dissidents and the defiant ones who have been singled out, often finding legal or bureaucratic cover, and set precedent by attacking unpopular minorities or marginalized malcontents. Then, it is easier to claim only backward, undemocratic states and enemies repress their citizens. The same governments can employ more violent means abroad, against those without a vote, and have little concern for appearances. Those who cannot imagine any other routine recourses in human society are inclined to defend the modus operandi, or reconcile themselves to it, or pretend it does not happen often. As a practical matter they avoid personal contact with the trouble they ignore as much as they can, chiefly by obeying. Who would not prefer to keep the ordeals of coercion or punishment abstract—felt only by someone else, at some distance—well aware that ordeals do not befall anyone in the abstract or “in theory”? Few even need to be told Obey or this can happen to you. If they never have cause to think on it, it is because they conform compulsively. It could happen anyway: a case of mistaken identity, a raid on the wrong house, or by walking along with the wrong color skin. It happens in order to catch quotas of offenders, or make convictions. It happens because legally-empowered armed agents have little to restrain them from enforcement of their own whims as well as laws. Few people who would willingly accept the role of enforcer would also abstain from this abuse of the power to abuse. The citizen has been taught that the good citizen owes obedience, in any case. Therefore he does not find the practices that compel it inherently offensive, especially in formality, and when they “follow the rules.” When the citizen finds out that police, military, or covert agents have used violent expedients like torture, assault, or execution unofficially, he is perhaps most shocked they did not follow the rules, and most placated by apparent discipline. To the inculcated citizen, disobedience is the egregious behavior; trouble or punishment for it are only to be expected. The disobedient are suspect to begin with, and conflated with blameworthy criminals or even enemies, if their motives are not also marred by perversion or insanity. If a response to them seems excessive, the initial feeling and principle remains that anyone defying authority has brought trouble upon themselves. But the citizen believes the finest of participation in popular government; and the citizen holds that its failures stem from apathy. He wants more governance, not less, and to stick his head further into it. He believes that others should too, for the abstract “health” of the system, though at the same time he expects that his own ideas should prevail in the “healthy democracy” he envisions, where everyone votes. He wishes to use the power of the state, at least to his benefit, probably to harness it for his good causes. He believes in his democratic right to have an impact on others—however the government does—wishful and delicately abstract about consequences. Rarely does a citizen have any part of enforcement—the actual means of rule, in the prison, in the court, on the bureaucrat’s desk, in the back alley—except to suffer from it, and hardly ever to control it. If he is outraged against injustices, he falls back on outlets as incongruous as holding up a protest sign during a burglary, or promising to vote against an assault. The typical citizen’s objections muster all the weight of a sternly-worded letter. The overruled subject has, least of all, means to restrain obedient enforcers set upon him; even less than in proceedings against him. To escape their reach presents almost as much difficulty. He has not even the power—the right or the capability—to take exception, stand apart, take nothing and give nothing, and be left alone. He cannot be entrusted with his responsibility. To be sure he is probably not trusted, not by those watchers who may know how to trust no one. But more than this, he is needed and he is required to play his part. For rulers need the ruled, as badly as demagogues need the crowd, and crusading moralists need contrite sinners; not only to obtain material gain and labor in their causes, but for the fanciful conviction that crowns some creatures of the species above others. Nevertheless the citizen, an insider hopelessly immersed in his culture, rituals, and beliefs, fancies themselves a participant, against factuality. The outsider would see ritual futility in the former, the vote; statistically-trivial in a great population, only periodic, and as a rule confined to nominated choices of rulers, but campaigned with farcical intensity. The argumentative frenzy at election time he would surely regard with puzzlement, and rising alienation. In the latter, the voice of the people, he would hear a babble; “it is the citizen talking or shouting at once with thousands or millions of others, who also lack the fame or high position to be listened to! Surely an indication of desperation, or derangement,” he would exclaim. It is hardly conceivable that the iconic foreigner—were there anyone from a land or a time so different—would listen for the first time to some citizen earnestly pay obeisance to these vaporous notions without a bit of the trepidation he might feel near a psychotic. “Yes, of course. Very nice,” the foreigner would carefully reply. The citizen’s implied approval of institutional violence-by-proxy would even strike a traveler from a past culture ruled without qualms as ludicrous, in its pretense of agency. To the pragmatist of history, this is the peasant believing he is the lord or the king, because he has theoretical strength in numbers. And a foreigner with an outsider’s mind would at least know it for an alien custom too menacing and mercenary to pass as whimsical. For citizens have not only the hope but the expectation to gain from political involvement. They expect to get their way to some extent—although this makes demands upon others, and even when it makes inordinate demands upon others they scarcely mind—and they experience disappointment and frustration when they do not get their way. Thus, citizens make mutually exclusive demands upon each other, and most are destined to be frustrated. For their lot, they blame the people with contrary designs, and not the impossible, irreconcilable, and divisive system under which they are ruled and encouraged to think they are rulers, they who lack the means of rule, and exercise none. 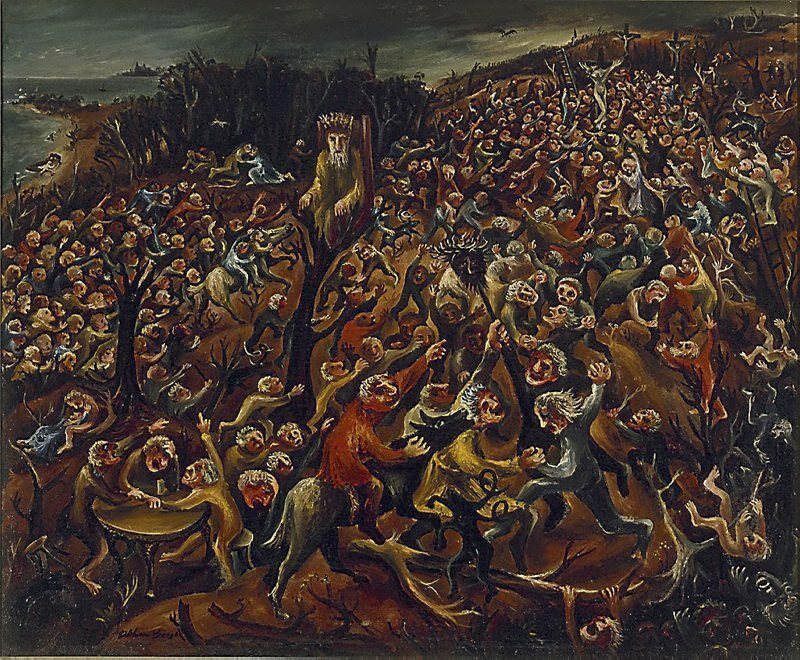 The Mockers by Arthur Boyd, 1945. TALKING IN ABSTRACTIONS allows thoughts to skirt substance, like phantoms gliding over ground. Talk can play out a pure wish, reproduce a platitude serving sanctimony, or erect a hobbyhorse subject to old spleen, and incur no obvious consequence or cost for never touching on concrete and corporeal matters. Heady and hallowed words—like power, war, glory, justice, health, democracy—will later play out in visible effects, in tangible consequences, and immediate situations to deal with, as well as feelings visceral to us. So will maligned and infamous abstractions—also free to reference like a well-known reality, as close as a familiar, as evident as an incarnation—lead only later to an unforeseen concrete outcome. When the first consequences are only felt in expressions and reactions, the talker need not confront what those ghosts of ideas they follow will likely make manifest later. Those most liable to be satisfied by words lack imagination to foresee, and knowledge enough to predict. The most persuasive language may have the least to do with substance, like the rhetoric of demagogues who have frightened, browbeaten, and cajoled captivated crowds. It is true that figurative language can exaggerate more freely, a device which propaganda never neglects in its storytelling. That does not suffice for the puppeteer’s purpose. The puppeteer learned how puppets work before plucking strings in a live performance. Before the demagogue opened their mouth, they knew the listener was in thrall to their attachments to certain metaphors, as well as inducible to mimic the emotions of a crowd. 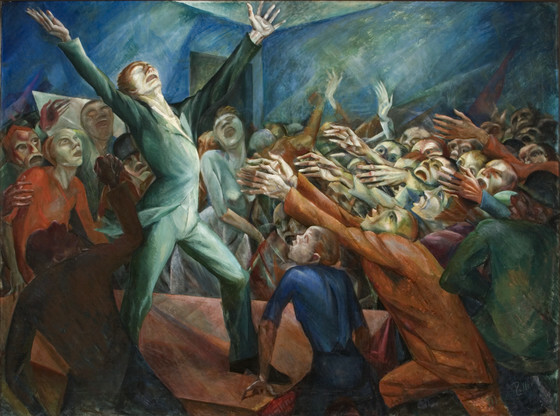 The Orator (Der Volksredner) by Magnus Zeller, circa 1920. These are sweeping metaphors of belonging and loyalty and kinship; decency, nobility, and hope; and objects of existential fears, fury, and loathing. Their points of contact with reality are emotional and primal phenomena, neurogenic, and not concrete. Affected tripe no more artful than this gets in the head of a listener. Many who hear metaphors dutifully repeat them like unforgettable doggerel. Initially listeners might have taken for granted that rhetoric is not literal, and therefore they did not hold figures of speech to realism. Circulation goes on until the absurdity of figurative expressions wears off. They are accepted quite normally and even seriously, the original reason for their coinage long forgotten. By now the public language of society is riddled with pandering metaphors dated to years or centuries ago, no longer guided by an immediate purpose but driving forward blindly. Forceful pack animals bear the gravitas and sentiment of yesteryears, ready to be drafted into the service of any base mobilization. On the backs of these ponderous metaphors, unsuspecting men and women are carried away. Many of the usual contrivances subsume disparate people and places into collective figments, which are infused with group belonging and mutual purpose. Though a fanciful grouping fails to match the group at all, few fault or dismiss the fiction, and instead try to realize the fiction. This is because discrepant denotation matters less to its meaning than emotional tenor, which rings true, true to a need. To begin to decipher the personal interests in a grandiose interest, follow the legal maxim remembered by Cicero: cui bono? Good for whom? The detective also asks, “who benefits from the crime?” as an indicator of motive. Suspect the motives of those with financial incentives, those courting fame and importance, seeking access to power, or those eager at the prospect of secure employment. One knows that publicly professing concern over “the nation,” “the country,” or “the economy” is not out of feeling for some unlikely bloc, or nonsensical monolith, but a cover for selective interests. Very likely, producers, financiers, or workers engaged in an industry that stands to profit or decline found common cause with professional courtiers, or ideologues craving relevance. Those urge, “We must do this,” or “We can’t afford not to.” They pretend that everyone in their “we” acts together, and will all succeed or fail together. Every unwitting investor and volunteer is welcome on the team or behind the cause. Far fewer leaders and eventual beneficiaries will be allowed. Invoking public benefit or necessity is the way for those with ventures or investments to convince many more with nothing to gain to lobby rulers on their behalf. Official support allows investors to unload risk onto everyone included in their common spirit. Subsidy increases short-term profits, at general expense. And if watershed events they have positioned to exploit can be engineered, they could make fantastic sums. They have no intention of sharing gains, or taking on the same risks they demand of others. To suspect is never to say decisively why events have been set in motion, or to infer planning and responsibility by motive alone. Even a conspiracy of interests can make an event opportune without engineering it. Nevertheless, groups who promote policy do not lack material or ideological motives which others do not share in. They advocate and lobby out of some special interest, making an investment of sorts, while the individual inhabitant, citizen, worker, or consumer cannot profit by such expenses. Individuals outside of politics lack a sensible interest in the capital except to demand let me alone, and the repeal of what has already been done to them. It is the function of promotional groups and coalitions with agendas to portray their special interests as the common interest—national security, economic development, public health—especially when, latent facts would tell, they do not coincide with the interests of most consumers, workers, citizens, or inhabitants. Warmongers in particular advocate a policy materially costly, dangerous, or counterproductive to most others, and that is the point of appeals to abstractions. The warmonger relies on faithful citizens’ emotional sympathies felt toward grand illusions. At first giving in to passions of a warlike crowd does feel good; these sympathies thrill, and reassure, and give meaning. Great profits do not land in every pocket, however, but in few at the expense of many. Nor does the civilian share in war’s great accretion of official powers by entrusting the newly-important politicians, the bureaucrats, the spies, and the generals. Fearing for their safety, obedient citizens endanger themselves by acceding to attacks on faraway targets in their name. Abroad, hostilities kill, destroy cities and homes, and embitter. Making war does not make peace, but risks making future enemies. Civilians are lucky to survive, poorer, less safe and less free; soldiers, to return home with nightmares and intact limbs; refugees, to find a home. 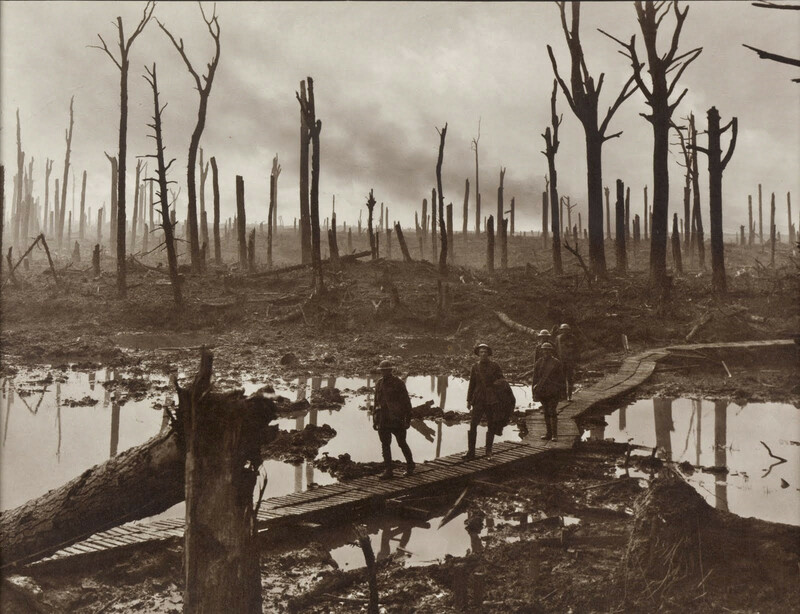 Destruction during the Passchendaele campaign (third battle of Ypres), 1917. THE GRAND ILLUSION is not merely produced out of distraction from phenomena and facts by officialdom’s mandates, or created by abstractions, possessive metaphors and other demagogic rhetoric, but engineered by sheer scale that pulls away from obtrusive realities, whereas features in front of our face must be reconciled, and sooner than distant concatenations of events. The close-up ethnic violence of splitting communities comes of identification with an artificial scale—like “forging a new, independent nation”—not contempt between familiar faces. To take a train ride across the border between former “enemies” India and Pakistan and visit similar streets, similar homes, similar people, is all that is necessary to dispel anxiety that descended from the time when Hindu, Sikh, and Muslim Punjabis were expelled from their homes, fled, or were murdered, after the Indian subcontinent was “partitioned” by drawing a line on a map between eastern and western Punjab. People more readily learn to fear or hate a far-away threat for little or no reason. In contrast, an aversion felt toward a neighbor might soon be revealed as paranoia or bigotry, difficult to maintain in the face of familiarity. The feuds that neighbors escalate are more likely spurred by contemptible dealings with each other than baseless, and therefore, if the grudges are not self-limiting, they may be amenable to making peace by mending those relations. Consider a different effect of scale. An inflated story does not seem so overblown when it tells a tale of the unseen, imagined to extend beyond the horizon, rather than things one can see. It captivates many of those who would doubt it on the smaller stage before their eyes. The soaring scope of disconnection from places and people permits both contemptuous and romantic idealizations that would have drawn ridicule otherwise, if they were conceivable at all. Even the sentiment of German-speaking families toward fields owned and plowed for generations could not cultivate the effusive propaganda of Blut und Boden among the people of some hamlet living on the local terrain. That slogan of agrarian nationalists, and then National Socialists, needed alienated populations living in industrial towns and cities to idealize the country in the distance; and it was the contrast to degenerate “asphalt culture” of cities (and urbane Jews) that flattered the “peasant” virtues of the countryside and gained popularity among traditionalists. Identity rooted in folklore actually required anticipation of size, numbers, and distances—not locality or community, familiar from experience. Size, number, and distance instill unfamiliarity. Without having to pay attention to any farmer in particular, völkisch writers could extol eugenics and rustic integrity to purify an incorporeal folk “blood” that courses through no one’s body, and yearn for an idealized race that no one has met. It would not be believed of just one’s own neighbors. The utopian myth would hardly drive a small town “back to the land” on a patch of nearby country; it required a “nation” to animate. Looking beyond the horizon, to Deutschland, one could talk of redemption through working the “soil,” without having to believe this of some familiar plot of dirt. By its grand and impersonal size, not subject to any sense, the nation could rise, faraway and eternal, yet present in the imagination. 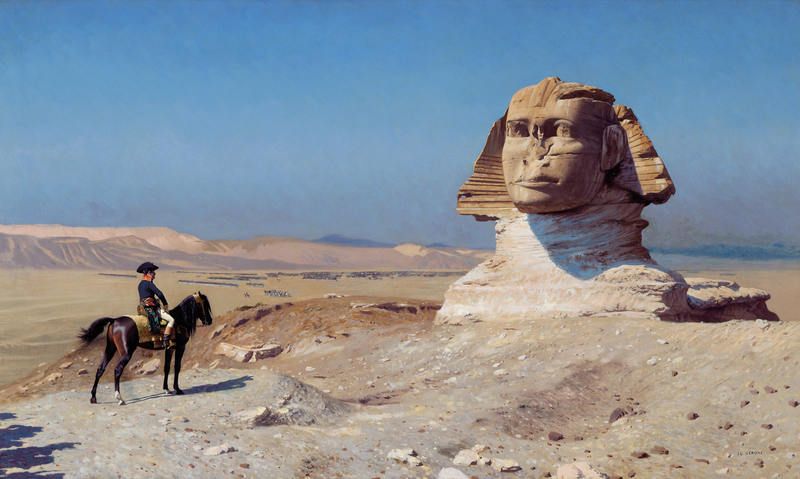 Bonaparte Before the Sphinx by Jean-Léon Gérôme, 1867–1868. IN THE GRAND ILLUSIONS OF PUBLIC AND POLITICS, one is forever trying to hide that nothing grand is at work. Grandeur of rhetoric, monumental scale, and popular fervency hide nothing other, nothing greater than each creature, animated in his or her pursuits and instincts. The society comprises nothing other than all of them together. Never does any part, any faction of organisms, any single organism, cease to be animated in its own causes because of invoking something else. No thing larger than persons and things requires their sacrifice. No nation is standing above them all. No majority decides. No value rules over men. Invoking a grandiose principle does not make the grandiose principle real. These are consensual pretenses for all those who cannot stand the naked knowledge that they, and those much like them, lack clear mutual purpose and belonging. It would be in error to assume that everyone wishes to see through illusion. Those who want for faith prefer to revel in grandeur, and they resent an indication of its falsehood. State and Church, which encouraged punitive fearfulness for institutional purposes, were not responsible for fear’s origination. Fear of what diverges from the mainstream clamors for an object. The incisive who see through grand illusions will automatically meet the same fate in fearful society as the outsider who merely dresses or intoxicates differently: to incur suspicion in a relatively tolerant variant of fearful society, and persecution, under illiberal treatment. The participant in grand illusions joins in for many reasons, not only conformism: his own entertainment; his own fear of irrelevance; his own need of richer sensations than he knows how to provide. One makes unimpeachable heroes of realer men because one needs them, and for the same reason, one subscribes to impersonal figments never to be pierced by sharp senses. The unmasking of status and scale is a lesson for the perspicacious, who wish to see past themselves, and see through illusions. In the midst of contrary reinforcement, it promises an unrelenting mission. It promises more, also, than liberation from servitude and suffering. Their reward for making themselves unwelcome foreigners in a world of fabrication is to be that finally, a grandeur of the soul genuinely felt, demonstrated in society by appreciable works, can become sufficient and resilient, and depend no longer on fragile pretenses and hypocrisy. It can be found in the exceptional place awaiting mankind, and not a part of it. Man, and not entitlement or affectation, can realize aspirations and find belonging. Dispel the grand illusions of nations, borders, titles, hierarchies, and do not fear that without them, Man would lack company, protection, significance, or access to any grand purpose. A well known quote in anarchist circles (in various translations), but more than that, a sentiment familiar to many in history with experience to know better than many people right now. I worry about anyone naive enough, or brief enough in their momentary span of historical (and cultural and geographical) awareness, that they would believe one recent election could make all the difference. Only now does it perhaps begin to occur to them that political power was not centralized in the state just for their benefit. Only now do they look with any real suspicion at the exercise of it. The institution of the state is not some new problem for people who have suffered under bureaucracy, or the whims of political leaders, or the systematic and recurring uses of power at their expense for the advantage of one agenda or special interest or another. For example, the troubles of an immigrant coming to America certainly did not begin with the Trump administration, as many young protesters seem to think. It would doubtless surprise most of them to learn that the Obama administration deported more people than any other administration (and all others before 2000), and pushed other enforcement policies such as criminalization, internment, and border militarization. The abuse of power concomitant with power itself is not a partisan problem but an institutional one. It’s noticing the evidence of the problem (or failing to notice, and rationalizing) that turns partisan, and biased according to party, faction, and animosity. The original monopoly of “the state” or “government” (on which all other attempted monopolies depend) is that of an exclusive claim to legitimate force, to compulsion—a claim to deserve obedience but also the right to compel it. This remains the essential formula of a hierarchy of political power to this very day. Those who believe they and their agenda rule, believe power is rendered fine and respectable as long as they rule, and only feel it is corrupted and dangerous when they lose power. It’s a strange alchemy, and a secular faith. If only it would occur to more people that any state powerful enough to give them things they demand, or dream of—if indeed their wants and dreams can truly be delivered and sustained by demands on other people—has to be powerful enough to take away what they hold dear, also. Sometimes I accidentally write political science, in the context of trying to write more compelling literature. I say that only half-flippantly. Experience tires of what it knows too familiarly, you see. Besides, politics skips over many things I consider essential preliminaries, in order to arrive at loud, thoughtless disagreement that much more efficiently. NB: Not written about current events specifically, but germane, and therefore I am posting it. I do not write about current events, per se. Current events tend to come back to the same things, again and again. I do write about those things. When it became fairly apparent (to others) that in time, manifest inferiors would rule democratic republics instead of the best men (in any usual sense, moral or able)—as so often happens in present day, in the calculus of voting machines, mass media, party and political machines—they made excuses. Rationalizations, critiques, and theories proliferated, and they have ever since. Most have blamed technicalities of constitutional procedure, or electoral process, for these “wrong” results. Many have blamed an uneducated citizenry. Partisans blame opponents. All these critiques come from ideological agreement, from those convinced of the rightness of democracy, or at least taking it for granted (a tenet without alternative), often from insiders in the political class. They would never conclude, for instance, that corrupt bargains for influence promoting oligarchs and plutocrats among the political class describes an equilibrium of theoretical popular governance, no matter its design. Insiders in particular would never interpret lack of intellectual competence among bureaucrats and politicians of the state as [suitable] avoidance of misspent, frustrated careers by competent people who have other ambitions and serve other masters. And the more enormous the bureaucracy, the more immune its unelected mediocrity to change by election of very few supervising officials, and their direct appointees. An unusual critique from outside the consensus lamented a perversion of the natural order by the weakening effect of misguided egalitarian doctrines, from democratic, Judeo-Christian, and socialist origins, promoted with the effect, if not also the intention, that diminutive, weak men could overcome their superiors. Men had become sheeplike, or overly tamed. This critique happened to agree with neo-aristocrats, oligarchs, and republicans alike that the many, especially the uneducated mob, were not to be trusted with the reins of government. Inferior men could climb up on their backs, to loud applause. Voting was a godsend to the ambitious political creatures whose talents lay in demagoguery, empty promises, fear-mongering, and other unscrupulous means. But to the traditional mistrust of demagogues, this critique added the [interesting] charge that the potential quality of men had been corrupted, not only by lacking education but also by excess of rote, mass education in uniformity, agreement, and passivity—in the name of equality and good citizens, instead of serving the more venerable, selective educational goal of cultivating a remarkable elite. Other outsiders critiqued democratic principle not for its foundation upon the many, but for sanctioning and legalizing the might of the many—called mob rule in its informal guise—as though numbers excused or ennobled the exercise of power, and in this case alone, might makes right. They saw no reason for surprise whenever democratic republics failed. For democratic institutions remained systems for assigning compulsory powers, not fundamentally unlike any ancient state for having devised representation, imagined “good government,” and forgotten the origins of governance in oppression by conquerors, caste, or class. They summarized that history has always reflected a generally conflicted (if not inverse) relationship between attracting the best men and offering them power. Power to enforce one’s will instead, unsurprisingly, attracts those who cannot exercise any consistent restraint, or corrupts those who have power, including those born into it. Exercise of power for aggrandizement is rarely tempered, with difficulty, only temporarily, and somewhat against the natural tendency. In fact the founders of modern constitutional republics were not unaware of this critique. Among them, skeptics of democracy as a positive good admitted they could not answer it, and feared it would prove correct. They were not naive enough to believe that men who acquired might would somehow cease to crown themselves right. They hoped that individual rights could find protection for a time, despite tyrants, oligarchs, mobs and demagogues. Now, the context for generating this digression was: writing about right and might (the famous debate in Thucydides over the fate of the poor island of Melos crops up) as an unusual, applied way of writing about a distinction between the “neutral” descriptive function of idealized science, and the prescriptive, normative, or persuasive functions of value-driven fields such as ethics, or applied science (medicine, psychiatry, engineering), arts, or religion. In a nutshell, saying what happens is importantly, quite different from saying what should happen. So actually, this is a representative selection in a sense, not for its specific subject material, but because it came about from the larger goal of teaching and reconsidering fundamentals through novel illustrations. In this case, philosophy of science through the lens of political science, in particular, all the thinking surrounding right and might, might makes right, etc. I went off on the tangent above (it happens), broke off that piece, and here you are.